Jackie Sherman, Author at The Jackie Sherman Group, Inc. The Jackie Sherman Group, Inc. Recently a CEO of a tech start-up contacted me for help. He had been fulfilling the role of marketing manager in addition to his role as CEO. And now that the product slate is getting more complex, he knew he would no longer have the time to effectively manage product marketing in addition to everything else that was on his plate. He is ready to hire for that position, but he’s meeting resistance. Jane, a nonprofit leader, brought together counterparts from four organizations with similar interests to create a strategy for securing joint funding. Although Jane knew each leader individually, the group had never met. They had only 6 hours for their meeting, presenting a great temptation to rush the process. Instead, I worked with Jane to go slow enough to ensure the group’s alignment and productivity. This is so important because going too quickly can be very wasteful. 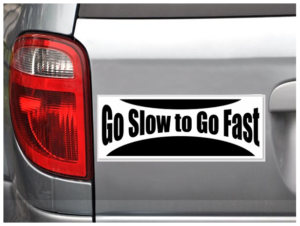 Simply put, if you go too fast, you will need to repeat the conversation, the decision, or the entire meeting. When we skip steps or leave some incomplete, we end up doing the work again. This costs time, which usually also wastes money. In my experience partnering with senior leaders, I often have observed that they don’t focus enough on their team’s shared work, and the team has problems pulling together so the organization advances. It’s crucial that the organization determines when a senior leadership team is needed, and if the answer is yes, for the CEO to pay careful attention to setting up this team. That’s when you need this high quality, easy to read book with its comprehensive model. For team leaders, the model is actionable; for consultants, it’s easy to work with; and for clients it’s easy to learn. 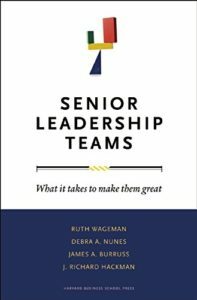 The authors have produced the best book written on the topic of senior leadership effectiveness. First published in 2008, it is a timeless treasure and my “go to” resource when working with senior teams. This book’s clear, concise model and explanations of how to apply it are an essential resource for senior leaders, consultants, coaches and all leadership teams. The authors’ research into 100 top teams from around the world shows how to craft an effective purpose for your team, staff it with the right people, chose the right structure, sharpen team members’ skills, and get the team support. While focused on senior leaders, I have found the model relevant for all leadership teams. Many years ago I participated in a training for facilitating groups, and my group was working on solving a problem that required us to influence each other. I thought I had a good idea for what we should do, and offered it with direct language. The group, however, continued talking about their own idea. They ignored me. I tried again, but their idea had gained even more steam, and they still ignored me. On average, 30-60% of our working time is spent in meetings. A basic building block for working with others, meetings are one of the most frequent ways that we get things done together. Recently several clients asked for my advice about how to improve their meetings. I began writing this post to answer their questions, and discovered just how much I take for granted about designing and facilitating effective meetings. 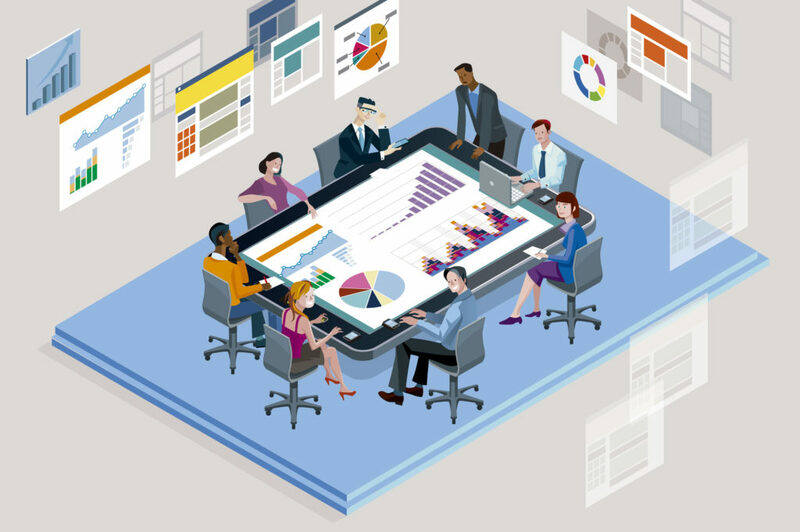 Since this is such a broad topic, this is the first of several posts to help you optimize your investment in meetings. While important, these are simply “basic meeting hygiene” tips; they don’t set you up for consistently effective meetings. By effective I mean meetings that accomplish their purpose and desired outcomes, and where the participants have had a positive experience and feel that their time and energy were well invested. The key to holding effective meetings is to use a robust repeatable process, without which your investment is at risk. Meetings are one of the most basic business processes, and a component of many organizational processes. Like all business processes, if you design in quality, you are more likely to get a quality outcome. How Well Do You Plan and Facilitate Meetings? Before establishing a meeting agenda I understand what other meeting participants think is important to accomplish. When I plan a meeting I take the time to think through each individual segment of work (the agenda items), who needs to participate in which ways, what time each item might take, and how to facilitate each conversation. I create a logical flow and put things in an order that allows agenda items to build on each other. In the meetings I lead we complete all the agenda items. Participants understand and complete the pre-work needed for the meeting to be effective. When we start our meetings everyone understands why we’re there and what we need to accomplish; participants are aligned. For each agenda item we clarify why it’s on the agenda, what we need to accomplish, and how we will do that. Each participant in the meeting understands their role for each agenda item. When we need to make a decision, we take the time to clarify the issues, hear each other, and develop options that arise from listening before making a decision. When making a decision, meeting participants understand their roles and how the decision will be made. At the end of the meeting, before running out of the room, we review what we did, the next steps, and if/when we plan to meet again. How did you do? If you answered 1= never, 2=rarely, or 3=sometimes to any of these questions, keep reading. You can easily improve the quality of your meetings. If most of your answers were 4 or 5, then congratulations, you are doing the basics well. You may still pick up a few good ideas below. Once it starts, every meeting has three basic segments – a beginning, a middle, and an end. However, there are two other critical segments – planning before the meeting and follow-up after the meeting. Without a good plan to start with, the meeting itself will take more time than needed and likely not accomplish its goals. And without follow-up much of the work doesn’t actually reach fruition. Sadly, it’s not over when the meeting itself ends. The Jackie Sherman Group is just one part of the equation. We only succeed in partnership with a committed client. Are you ready for success? There's something different about the way you're able to relate. It feels more genuine than simply that you're doing a job; while always being exceedingly professional. For 2 1/2 years Jackie provided consulting support to our diversity leadership group and facilitated numerous large and small group interventions thorough our business unit. She is very talented and brings to the table an extensive experience base coupled with a level of insight not found in many consultants. I recommend her highly. Coaching with Jackie has helped me in taking a softer, more personal approach to working with clients. She has an ability to listen very closely, not just to the verbal, but also the nonverbal. She knows when to dig deeper and notices what I didn’t see about myself before. She has also helped me become more systematic and consistent as a small business owner. Jackie got me to slow down, which gave me space to think differently. She especially helped me, in my leadership role, work through getting others to collaborate and think through challenges on their own. Jackie creates a good connection, where I can speak freely and feel listened to – it has been valuable for my personal development. Jackie led us through a strategic planning process that included input from our multi-generational congregation and leadership team, resulting in a dynamic plan that we put immediately into action. The outcome is that we’ve experienced a new level of growth and vibrancy for our congregation. Jackie is highly skilled at working with groups – she was just the right person for this endeavor. Jackie facilitated a strategic planning process for our organization that received very positive feedback from our board and donors. I was impressed by her ability to work through the high-level conceptual challenges. And as a leader, I truly appreciated her willingness to ask the hard questions and challenge me to think things through, which always improves the end product. The strategic planning process Jackie facilitated resulted in a plan and structure that has enabled us to better organize our work, broaden our service area, improve fundraising, and engage volunteers – the plan helps us fulfill our mission. Jackie did a great job of managing all of our opinions and passion in an honest, but delicate way. I’m so pleased that, several years after working with Jackie to complete our strategic plan, we are running the organization using the plan as an actionable template. The plan has become embedded into our culture. Jackie’s approach is smart, practical and very thorough. We trusted her process and got the result we wanted. Jackie’s coaching has helped me to lead better in what can be an emotionally charged theatre environment. She helps me get to the core issues, deal with the bigger picture, and formulate an action plan. She is very responsive and resourceful and draws from her deep experience in both the for-profit and non-profit worlds, which gives us new perspectives and insights. Jackie has been a coach and strategic thinking partner for me since 2004. She is a great listener and her broad base of knowledge provides an outside perspective to think through problems in ways I can’t do on my own. Jackie helps me come up with processes, is good at showing me my strengths, and she’s helped me add very useful tools to my toolbox. You can either win or lose during a transition, so it’s important to pay attention to this critical time. The first transition Jackie coached me through was so successful that I have retained her for every work transition for the last 10 years. She helps me get a clear view of the situation and approach it strategically. Her keen observation skills set her apart from everyone else I’ve worked with. Jackie helped me 'see' the right questions to ask. We made dramatic progress in 300 days. I don’t usually praise consultants in public, but we couldn’t have done this without Jackie Sherman. Please accept my sincere thanks for your excellent organisation. It really made it a successful event! Your dedication and your support to the design team were essential factors in this success. You managed to keep us on track with the schedule without constraining the group's creativity. I was positively surprised with the way we were able to engage such a large group and raise all the critical issues. And it was quite remarkable to see us achieve consensus around a very good list of action items. A lot of this, was due to your engagement and experience! Working with Jackie was truly a developmental experience and a real pleasure. She was able to “get to know me” very quickly, using probing questions and strong listening skills, and then effectively used that knowledge to ask challenging questions throughout the coaching experience, forcing me to look at things differently and explore different options. She brings a holistic approach to coaching, helping the client discover the connections between different aspects of work and life, and the interdependencies of mental, physical and emotional states. It is this unique approach, and the resulting new awareness found, which has made a long lasting difference for me. I have worked with a variety of consultants over the years and have only highest praise for Jackie’s consulting abilities. She worked with a variety of individual and groups during our project. In each of these relationships she met and exceeded our expectations. We would jump at the chance to re-engage Jackie in the future on any organizational change or organizational development project. You helped us with many important changes. Our organization is a different place now. We have greatly improved our communication and decision-making. The 3 years that we worked together were very rewarding for me and rich with learning. I had very challenging times and I could not have made it through without your support. I believe the library has a better result from our reorganization because of your involvement with us. Since 1999, I've had the pleasure of working with Jackie in multiple roles and scenarios. Her expertise in effective organization design, change and leadership is unique both because of her truly global, diverse experience base; and because of her deep theoretical knowledge paired with ongoing practical application. Jackie meets you where you are, works with you to clarify where you want to go, and helps you get there! She has a gift for creating an environment where you can sense her expertise at work without feeling like the latest 'coaching tool' is being pulled out and used on you. Her commitment to excellence, growth, and success has been instrumental in helping me achieve several professional and personal goals.